Sabres writer Bill Hoppe has taken to Twitter over the past few weeks to identify a specific player who was regulating each particular night. My fandom of just about all Emilio Estevez flicks and the general awesomeness of Young Guns makes this particular Twitter meme that much more interesting to me. Last night’s offensive explosion led Hockey Heaven Buffalo to seek nicknames for the Tyler Ennis, Drew Stafford, Marcus Foligno line. Given their relative age and consistent regulation, why not the Young Guns or Regulators line? There will be a photoshop to follow. All kidding aside, Buffalo’s blowout of Tampa was important for their place in the standings and their confidence to produce offensively. The Regulators combined for seven points (3+4,) including a pair of goals in the first period. Jason Pominville also had a pair goals that went top cheese, Thomas Vanek had two apples and Cody Hodgson finally recorded his first two points (assists) as a Sabre. Ryan Miller made some timely saves while the game was still in question and finished with 24 saves on 27 shots. The hot story surrounding the Sabres has been the play of Foligno. He has five goals in his brief time with the big club, has shown a physical side and has vastly improved his skating since his debut in Ottawa earlier in the year. Foligno looks massive on the ice and is the type of space creating winger the Sabres have long been searching for. While Ennis has been a revelation at center, I think Foligno’s style is the reason that Stafford has flourished lately. Foligno can play the banging style that Stafford seems to refuse to play, this leaves the North Dakota product to create with Ennis in open ice. The makeup of the line is as prototypical as you get, but it has been working wonders. While the Sabres didn’t gain ground in the standings, they kept pace with two points. They certainly need the Caps to cool off for this stretch run. I still think that winning games will get the job done for the Sabres. There isn’t too much need for scoreboard watching at this point. If the Caps were to hit the skids prior to their meeting with the Sabres, it would be quite helpful for the big picture. As the final two sets of back-to-back games loom in the coming weeks, the Sabres’ offense will take center stage. I’d expect to see Jhonas Enroth one last time for one of these back-to-back sets, but the need to score goals remains paramount in my opinion. 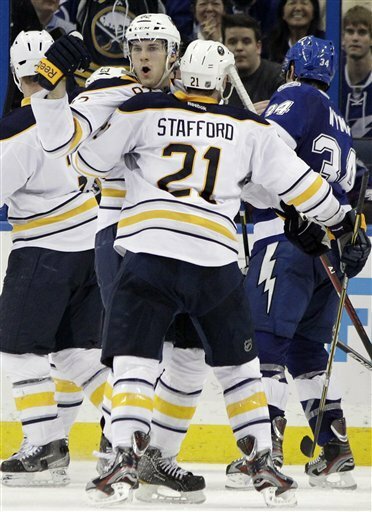 The Sabres showed another flash last night, they need to maintain this run for the final nine games. Cody Hodgson probably won’t be left alone until he scores a goal, but his assist on Jason Pominville’s power play goal was a beauty. He did a great job drawing the forward and defenseman before dishing outside the box for Pominville’s one timer. That is the type of play he has been making since his arrival, he finally had someone finish for him. Andrej Sekera has a fairly manageable contract for a player making the impact he has this year. He has been terrific since the New Year and has been above 21 minutes in the two games since returning from his illness. I still wish they would give him a bigger role on the power play. Getting Tyler Myers back will put Lindy Ruff in quite a predicament. Brayden McNabb will need to go back to Rochester but there isn’t a clear-cut player to scratch in order to insert Myers back into the lineup. Mike Weber has had a few gaffes, but is still a serviceable number six defenseman who can kill penalties. Alexander Sulzer has been strong in his few games and possesses better puck skills than Weber. He is physical, just not as bruising as Weber is on a nightly basis. It will be a tough call either way. I laughed out loud at the first caller to the postgame. I’m also concerned that Ryan Miller’s GAA is going back up, especially when the third goal he allows is in garbage time on a tipped point shot. I’m very concerned about his play too. Especially because he has continued to make timely saves in these recent victories. Just because he isn’t playing at a Hasekian level (like in February) doesn’t mean he isn’t playing good hockey. Where does Nathan Gerbe fit in this lineup? You can’t remove Foligno or Tropp from their respective spots. The easy answer is to drop Cody McCormick from the fourth line. I’m interested to see the decision Lindy Ruff makes once Gerbe is healthy. For those staring at the standings, the Sabres need 12 points to hit 90 and 13 to hit 91 for the year. Anything between 90 and 93 should be the magic number for the playoffs.